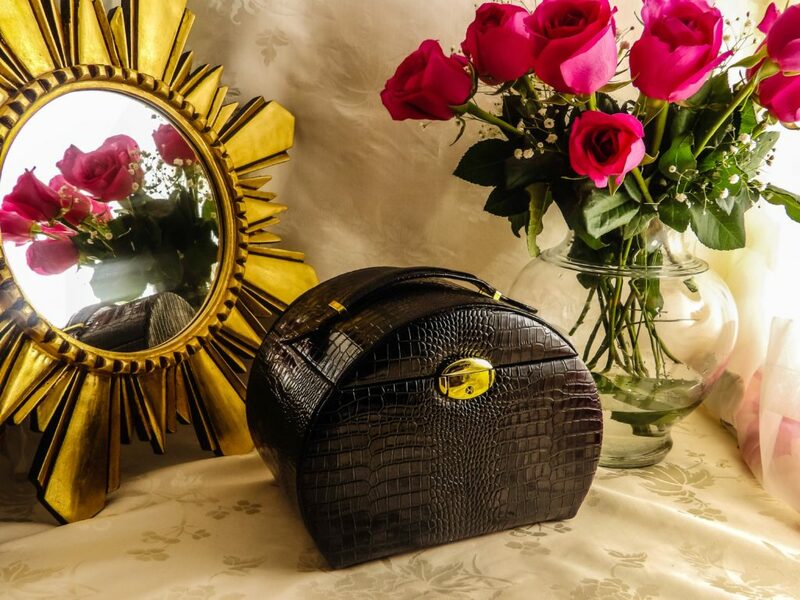 Sitting pretty atop a dresser, yet ideal for travel or destination weddings, the Langria Jewelry Box looks like a vintage styled handbag, but inside there are ten velvet lined storage compartments to safely & securely hold a variety of jewelry. Do you love handmade jewelry or vintage jewelry finds? 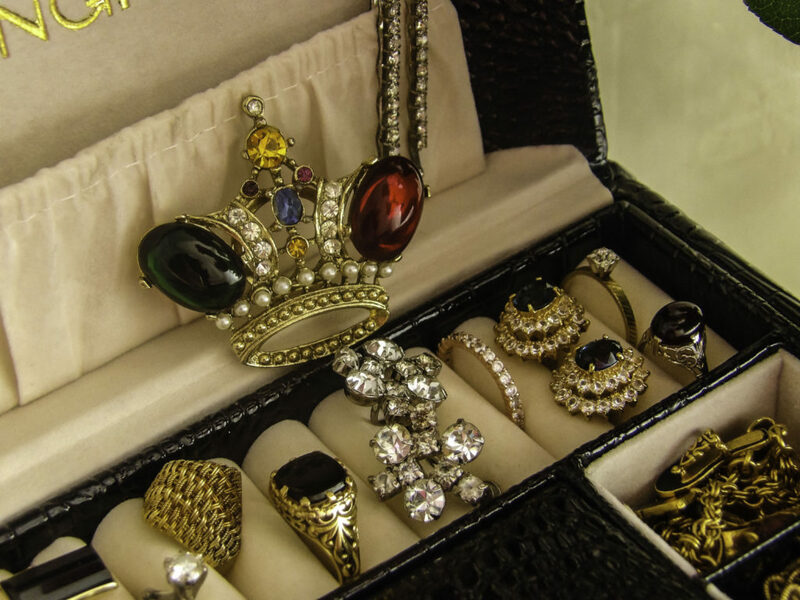 Several heirloom pieces, second-hand jewels, vintage pieces as well as handmade jewelry often do not come with the original box to keep the jewelry safe, or the gift box or bag is just intended to present the jewelry, not to protect it in storage. 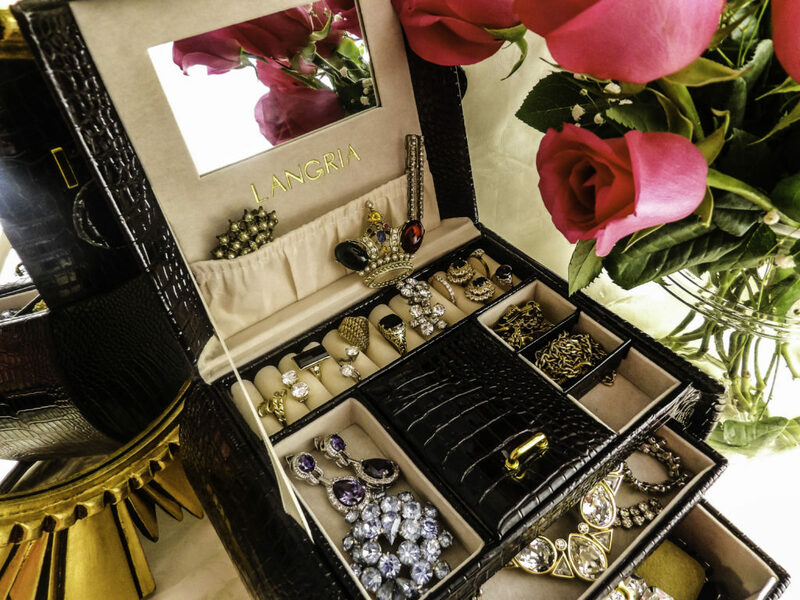 I like the soft velvet interior and the multiple compartments of the Langria Jewelry Box that makes for ideal storage for “loose” or unboxed jewelry. Something that frustrates me about many jewelry cases is that the layout often doesn’t suit the needs of my jewelry collection. The Langria Jewelry Box has ten sections that comprise seven types of storage compartments within the three layers of the jewelry case. This functional, multi-compartment design keeps jewelry organized and separate from other pieces to avoid scratching or tangling. On the underside of the case lid, below the mirror, there is an elasticized fabric pouch pocket for holding especially small or delicate items such as small sentimental keepsake items, shoe clips, or hair jewelry. The elastic is secure, and items do not slip out when the case is closed. The uppermost section of compartments is open-face. In the rear of the case is a velvet lined ring roll section with eleven slots to hold rings, earrings, or pins/broaches. For small, simple rings, two rings may fit per slot. The padding is deep so that even a larger ring is securely kept in place with adequate room between each ring. The left front third is a full velvet lined compartment for holding larger pins, broaches, necklaces, or dangling earrings. The middle front third section has a lid with a handle to provide extra protection for one or two small to mid-size pieces. The right front third section has three removable horizontal dividers that could hold cufflinks, earrings, necklaces, and bracelets. Beneath the top open-face compartment section are two pull-out drawers (one narrow full-width drawer and one deep drawer with two sections). The narrow drawer easily holds several necklaces and bracelets. The deep drawer is suitable for jewelry in a drawstring bag, ring or bracelet boxes, or for holding loose pieces such as bracelets, broaches, bangles or a watch. WHAT MAKES THE LANGRIA JEWELRY BOX SPECIAL? While this case looks pretty on a dresser, I particularly like that the jewelry box is shaped like a vintage style hard case handbag, and it has a notably sturdy wear-proof handle to carry the case. This portability makes it a very useful item for transporting jewelry for various occasions. TRAVEL: In addition to holding jewels at home, I like that the sturdy wear-proof handle and case construction makes the Langria Jewelry box ideal for traveling with jewelry. Some events that it would be particularly useful include destination weddings (helpful for the bride, bridal party or wedding guest), for extended business trips, vacations, and special occasion events. Jewelry packed within luggage can get lost or stolen; the Langria box is “purse-sized” at 8.9 x 6.1 x 7.5 inches, it weighs about a pound and can be kept discretely in a carry-on bag. 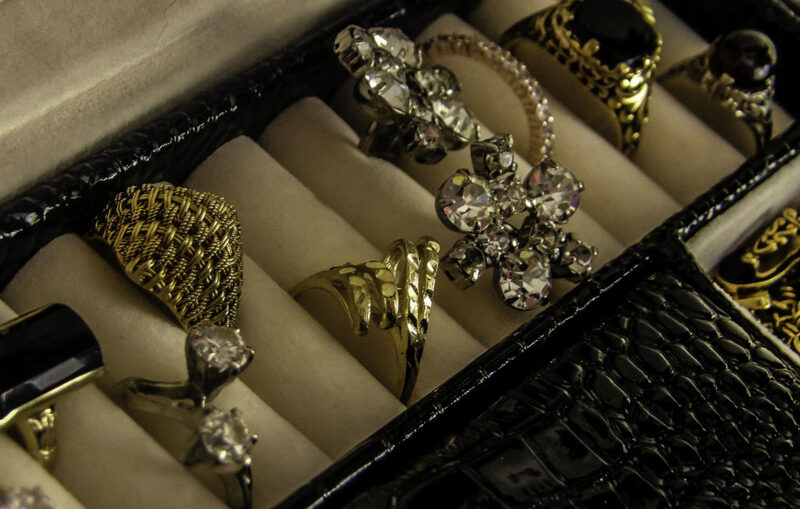 WEDDING JEWELRY CASE: Wedding jewelry comes in many forms: Heirloom pieces with sentimental value, handmade jewelry, delicate vintage jewelry finds, rented and borrowed jewelry, and pieces purchased just for the wedding. What do all these have in common? They all will require being stored and transported safely and then held securely before and after the wedding. I find this the perfect size for holding both the bride’s and groom’s jewelry, bridesmaids’ jewelry, or just the jewelry of the bride including the rings, necklace, bracelets, and hair jewelry. A stylish vintage look, the Langria case comes in three colors. We got the black. 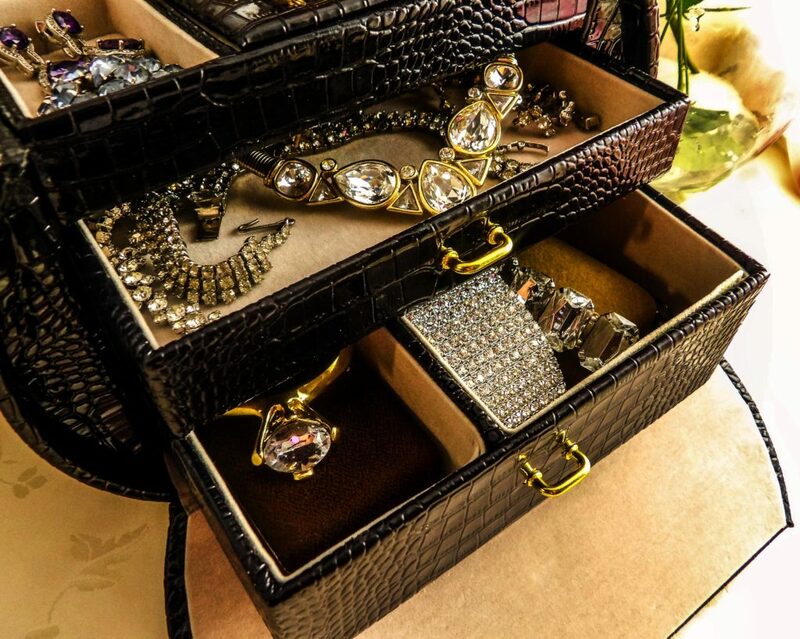 Each compartment is velvet lined to keep jewelry scratch-free. The ring roll is heavily padded to give rings enough room yet hold them in place. It is very sturdy, and the drawers and compartments are solid. It comes with a key lock on a secure double level closure that snaps shut to keep the jewels safe. It has an embossed crocodile pattern, patent leather look. There is a small, accurate reflection mirror. The Langria Jewelry Case makes for a gift for someone developing a jewelry collection, for someone who has an overflowing jewelry collection or makes jewelry, or for a destination wedding bride to hold her wedding jewelry, for a young woman going away to college who may wish to keep her jewelry safe under lock and key. It also makes for a nice bridesmaids gift, especially if bridesmaids are wearing jewelry or hairpieces to the wedding. 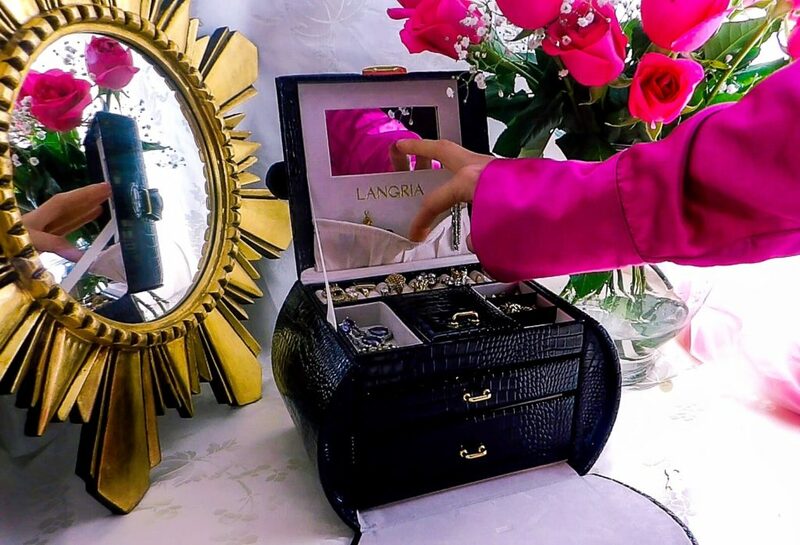 The Langria Jewelry Case has a vintage handbag shape with a sturdy handle, making it an ideal a carry-on piece to safely transport expensive or sentimental jewels in a scratch-proof, locked case to keep your jewelry with you safely while traveling. I like that the multiple compartments keep my jewelry safe, and that dangling earrings have their space, there are adequate slots for my rings without crowding them, and necklaces remain tangle free because they are stored separately. Ideal for travel or home use, this is a highly versatile jewelry case! Find this great jewelry case at https://www.amazon.com/dp/B01M130DIB?th=1. Through March 5th, 2017, you can receive an extra 10% off with code 9PGEN9C9.